It took me years to feel confident about making pie dough. I could work myself into a froth just thinking about all of the things that might go wrong. Should I use shortening, butter, a mixture of the two—and what about the elusive leaf lard? Must I add lemon juice, vinegar, or vodka? What if I add too much water, too little? Will I overwork the dough, or underwork it? Will the dough stick to the counter, to the rolling pin? How does one roll an even circle? Over time I have answered all of these questions, and have developed this recipe that is flaky, buttery, salty and sweet. In other words, perfect. Pie is a wonderful dessert because you can make it all year round changing the filling with the seasons. 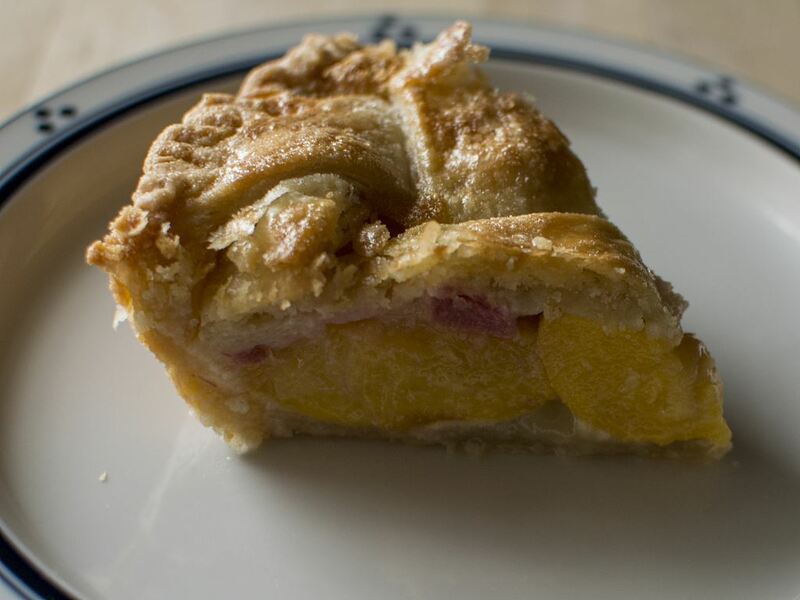 Peach pie is one of my favorites. 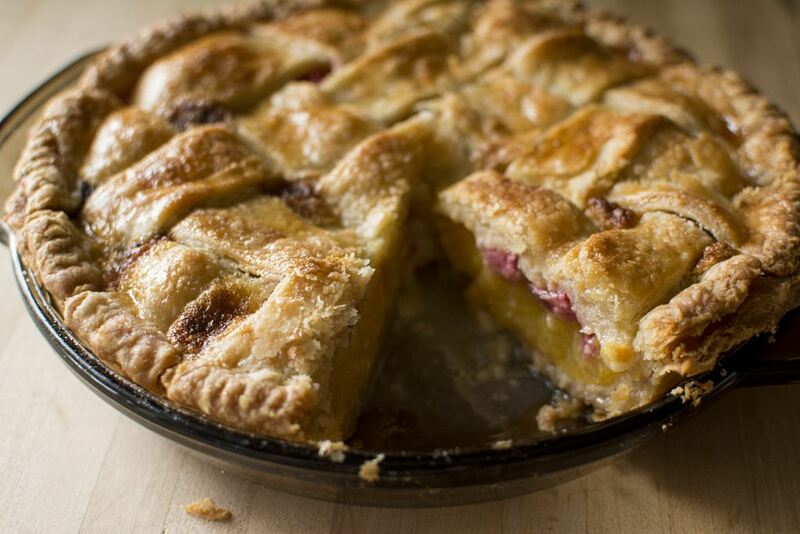 We all know that peaches are a summer fruit, but until recently I thought of rhubarb as a spring thing (technically a vegetable, but most often used as a fruit in this country.) 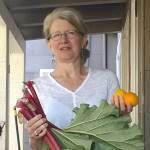 When I saw rhubarb at the summer farmers market, I thought it would taste great with peaches. And, as I’ve mentioned before, I adore the color combination of orange and red in dessert. I thought I was so clever. It turns out that this was not an original idea!! Others, before me, have thought of this brilliant combination. However, instead of thickening the filling with flour or cornstarch, this pie is held together with a light custard, scented with cardamom, cinnamon, and vanilla. 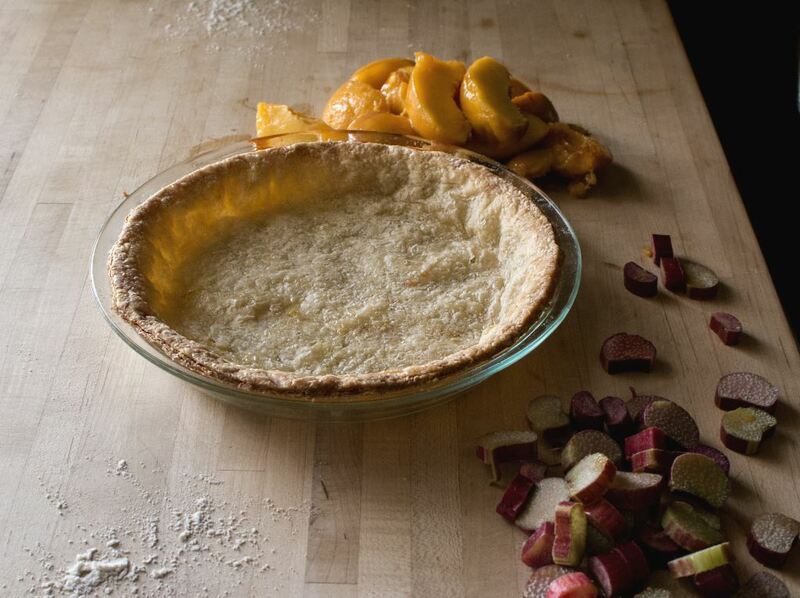 The only thing that keeps me from eating this pie all year long is the fleeting season of peaches. 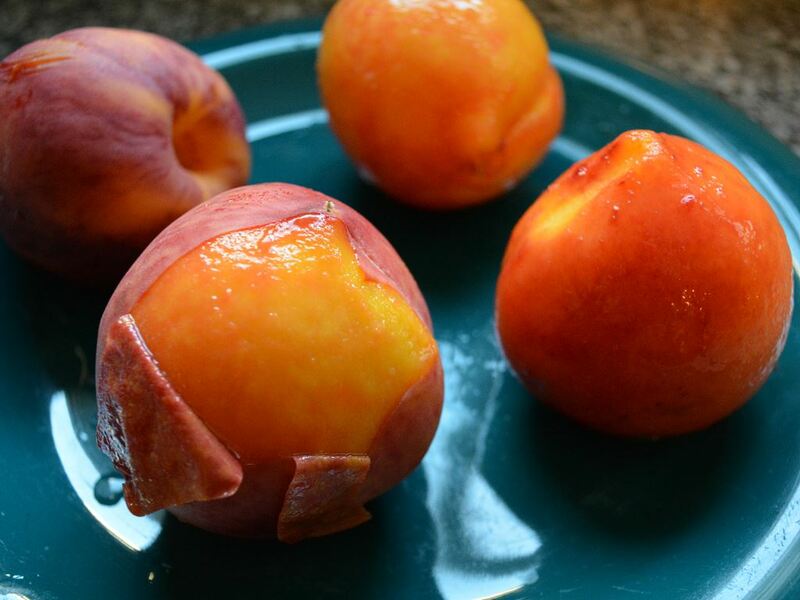 Some of the best peaches I’ve had were at their peak in August and September. Make this pie while you still can. It will be fall before you know it. Blanch the peaches for a minute or so. The peel will slip right off. I like to fully bake the crust before filling. This keeps the crust from being doughy. I used a paring knife, but sharp kitchen shears are also a good tool to trim the overhanging lattice. Roll out the two pie dough disks. Use one to line the pie pan. 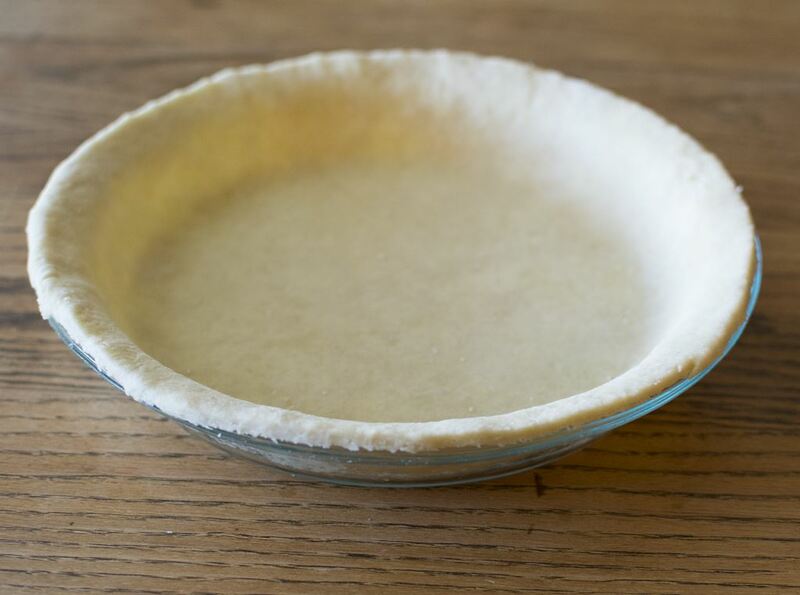 This time, once you’ve tucked the pie dough tightly into the pie pan, trim the edges evenly with the edge of the pan leaving a just tiny over hang. 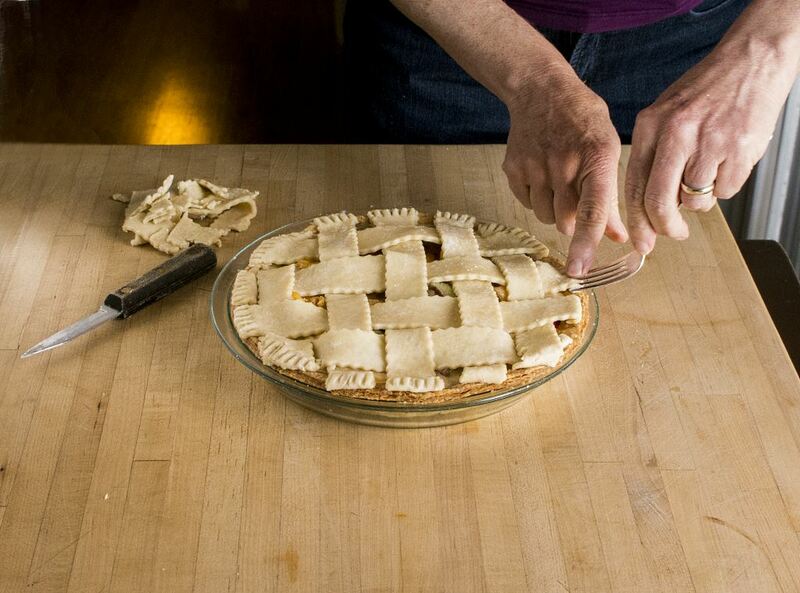 Don't turn the edges under for this pie because you will be attaching the lattice top later. Blind bake the pie shell until fully baked and golden brown. Set aside to cool. 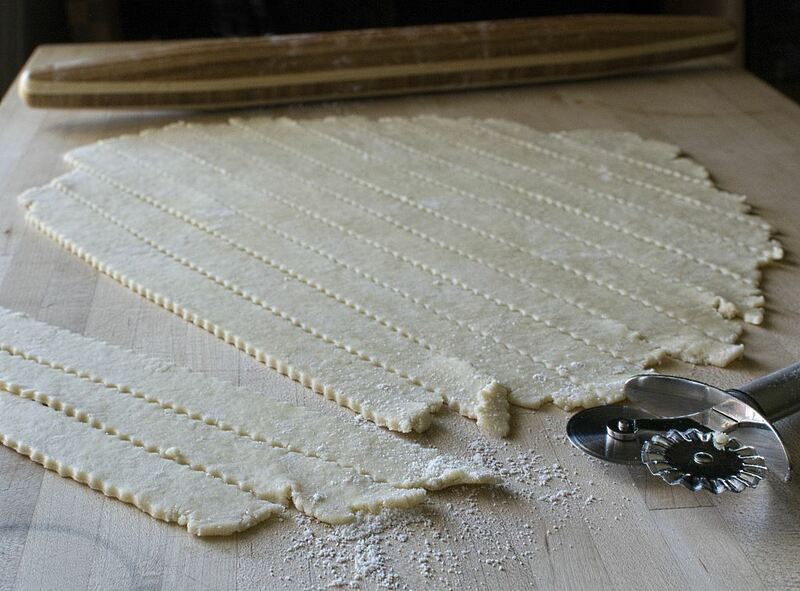 Cut the other rolled out disk into strips to use for lattice. 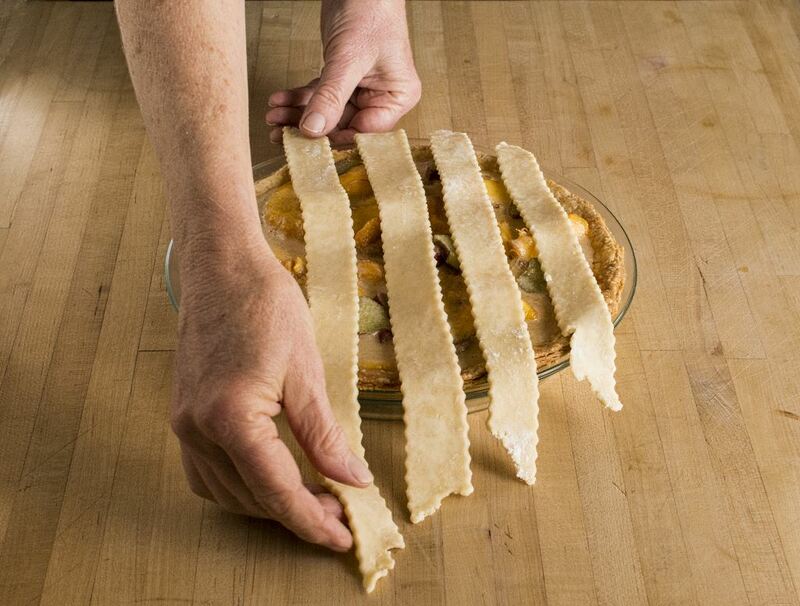 Place the lattice strips on a parchment lined baking sheet and then set aside while making the filling. Bring a large saucepan full of water to the boil. Gently drop the peaches into the water using a large spoon. Take them out after 30 seconds to 1 minute. Pull the skin with the flat of your finger. The skin should have loosened enough to peel with your fingers. 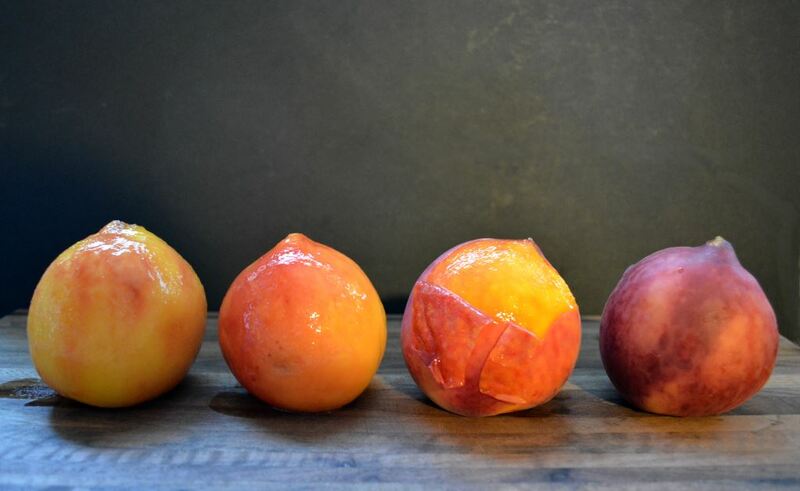 Peel the peaches, cut in half, remove the pits, and cut into thick slices. 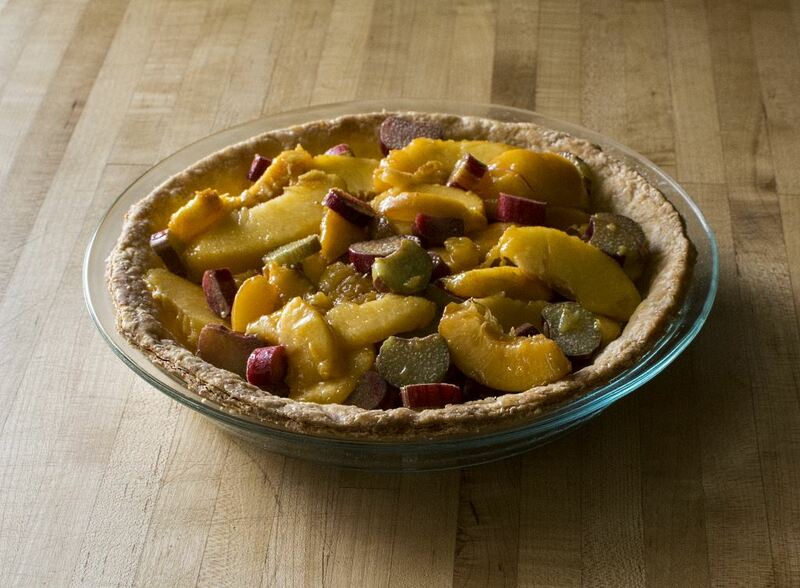 Put the peach slices, and rhubarb slices together in a bowl and gently mix together. 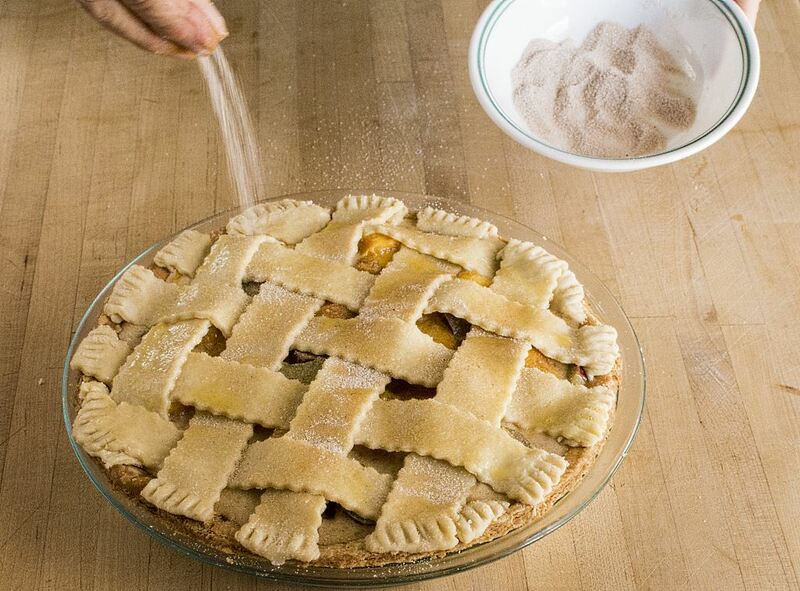 Put the fruit into the pre-bake pie shell. In another bowl, whisk together the sugar, salt, cinnamon, and cardamom. Add the vanilla extract, eggs, and melted butter and whisk to combine thoroughly. Pour the mixture over the fruit. Arrange the lattice strips on top of the fruit. 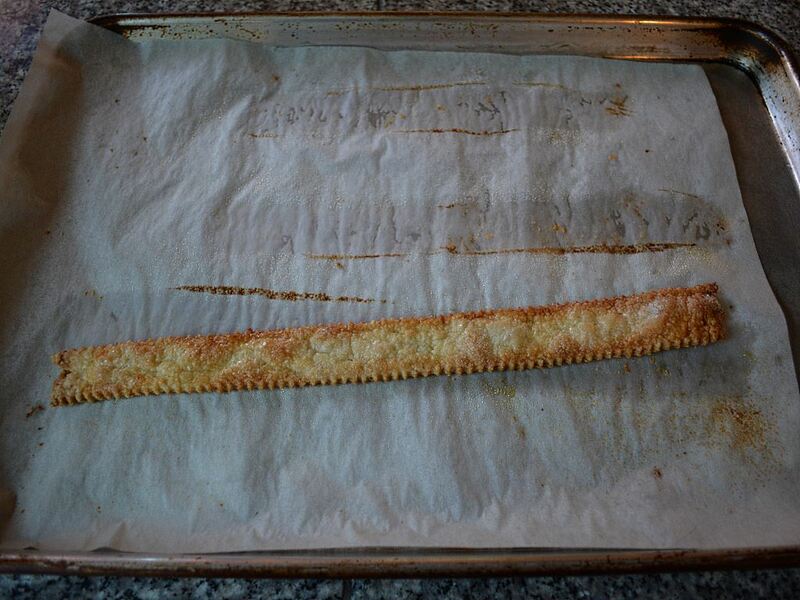 Trim the edges, and crimp the strips to the baked crust. Egg wash the lattice. Sprinkle with cinnamon sugar. Put the pie into the fridge or freezer for about 15 minutes. While the pie is chilling, preheat the oven to 425°F. 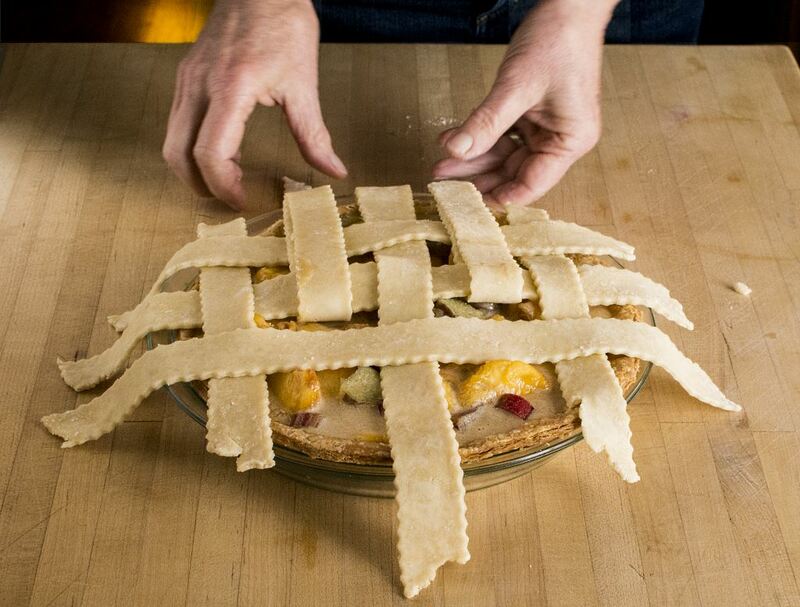 Place the pie on a baking sheet to catch any drips. 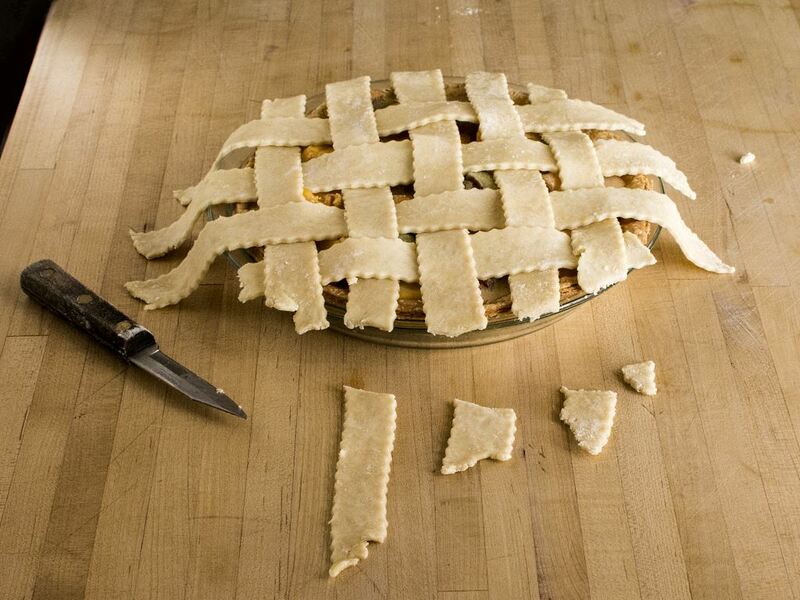 Bake the pie for 10 minutes at 425°. Then reduce the heat to 375° and bake for another 30 minutes, or until the pie is golden brown and the filling is bubbling. Serve alone, or with rhubarb sauce and vanilla ice cream. Leftover lattice strips make the best baker’s snack! 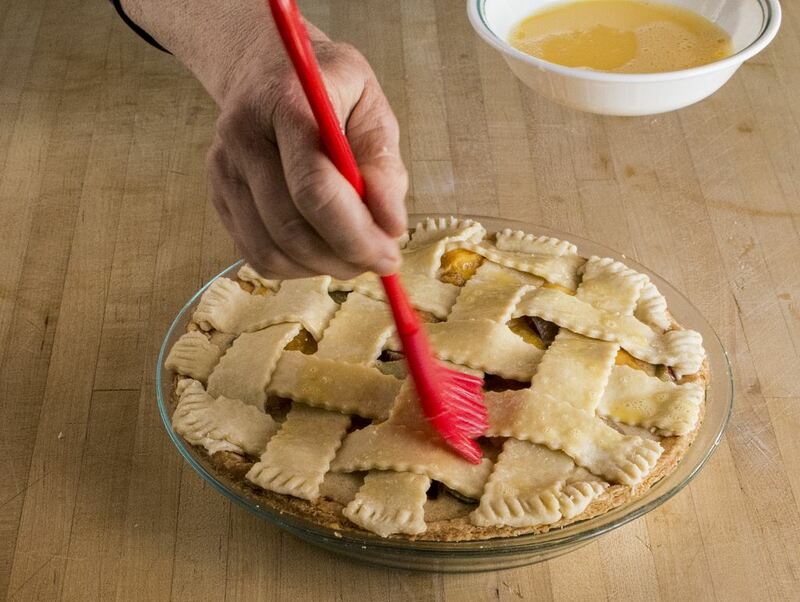 Trim the dough even with the edge of the pie. Find your next favorite recipe!